Oh how I love this sweet Pansy Bunny! I couldn't wait to color it up....and oh my, it WAS fun to color. I paired it up with the *thank you* sentiment from my Salutations clear set. The main panel is up on foam tape, the edges are sponged with rose red ink and sewn, and I added little bits of Stickles to the centers of the flowers. F-U-N! Hope you have an awesome day! 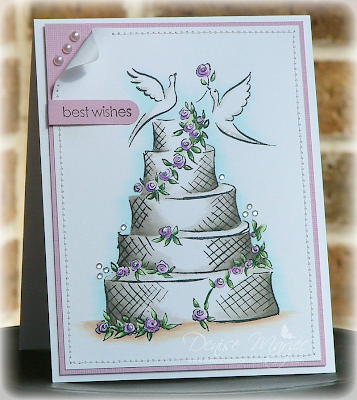 Here's another wedding card I made using more of my new Penny Black stamps. The specific names of the stamps are in my supply list at the bottom of this post. 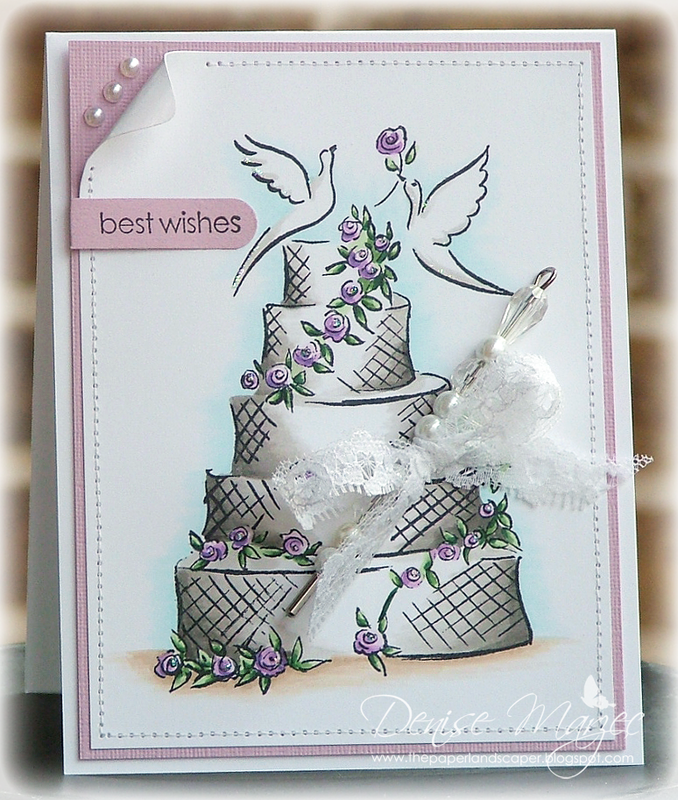 I originally had a big lace bow and hat pin on this card, but I didn't like how it covered a lot of the cake. After gluing down the bow and pin, I removed it....but of course, I ended up tearing a little bit of the white CS in the process so I had to think of something to "cover" the tear. That's where the tiny twinkles came in! ....and that, my friends, is my (goofy and clumsy) creative process, lol! That's it for me today! Have a good one! We had a bridal shower for my cousin yesterday and this is the card I gave to her. 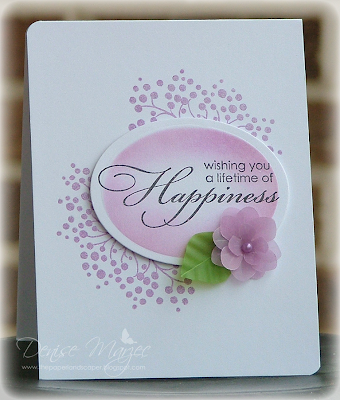 I stamped Penny Black's 4180J Reverie in Brilliance pearlescent purple twice on the card base. then I stamped 4185F Happiness in black craft ink, heat embossed it in detail clear embossing powder (my favorite EP! 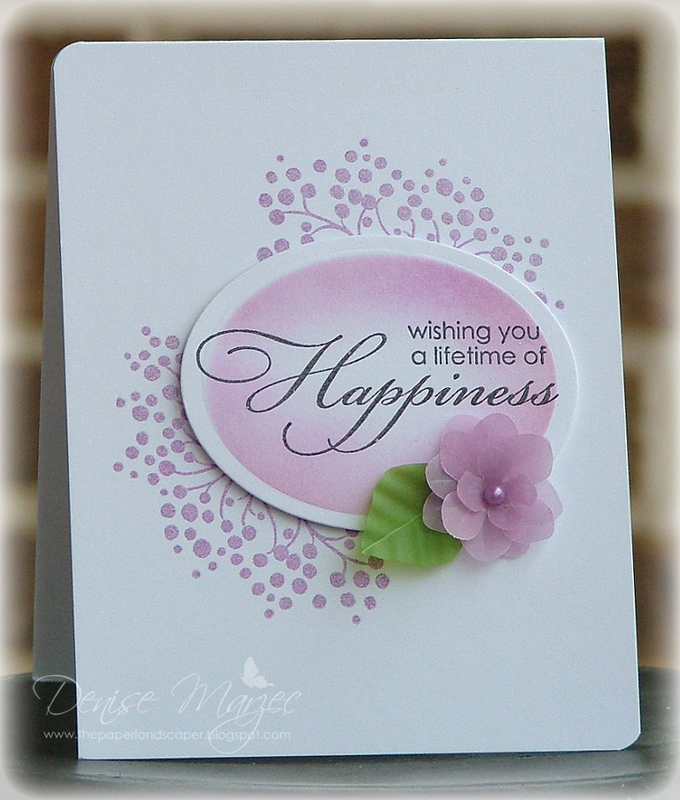 ), cut the sentiment with an oval nestabilities die, left the die in place and sponged more of the Brilliance purple ink around the sentiment, and then popped the oval up on foam tape. The gorgeous purple vellum flower and leaf are from my friend Carol (thanks again, girlie!). The pearl in the center of the flower was colored with a V15 Copic marker. Happy Saturday! It's time for our weekly sketch over on the Sweet Stop. 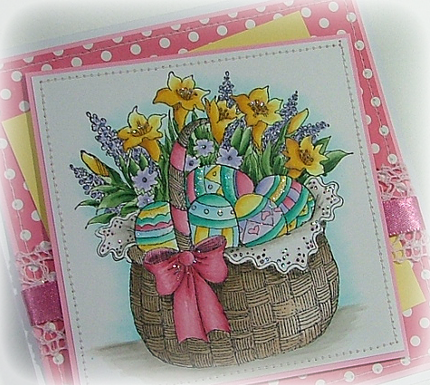 I've had this Magnolia image colored up for weeks and finally made it into a card. I don't know the name of the stamp (the image was stamped and given to me), but boy do I think she's cuuuute! The main matted image is up on foam tape and so is the circle sentiment. Stickles were added to her apron and hair bows. The Kaiser Craft pearls were colored with a YG23 Copic. 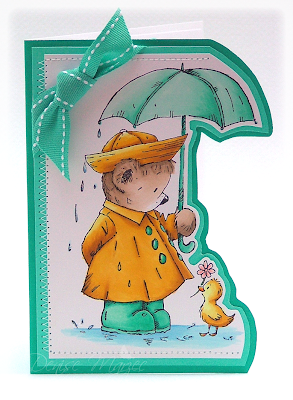 The DP is Little Girl by Echo Park and you can get it at Sweet 'n Sassy Stamps. The sentiment is from Taylored Expressions. Here's Korin's sketch if you'd like to take a look and play along. 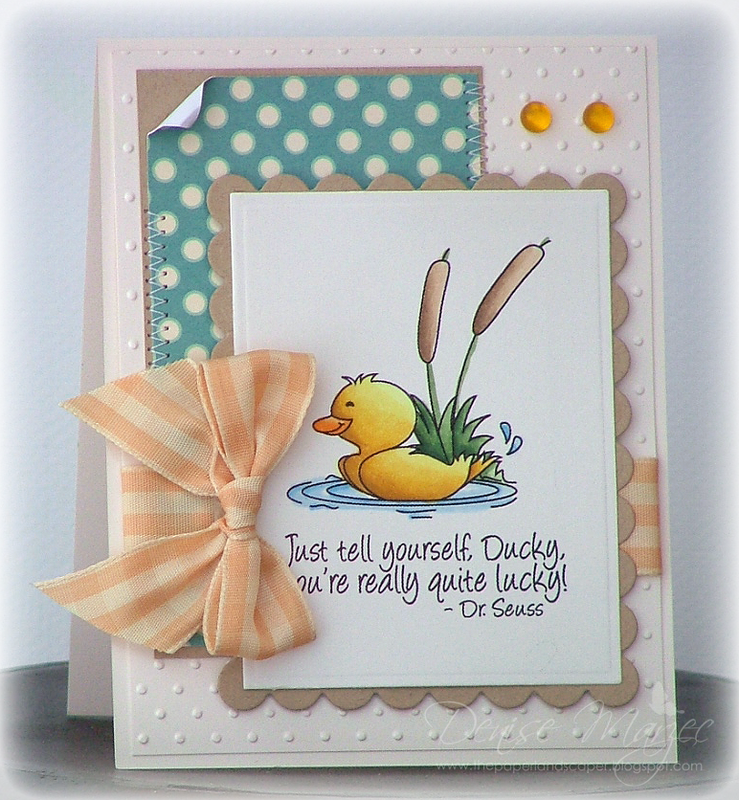 I've had a lot of fun hosting this week's Penny Black Challenge and I hope you did, too. For my final card this week, I went with a clean and simple style. I stamped the Lace Edged flowers in Lavender Lace ink on the card base, stamped the Beautiful Ways sentiment in black and cut it out with a Labels 10 Nestie, and then popped it up on foam tape. Thanks so much for joining us this week! That's it for me. Hope you have a really great day! 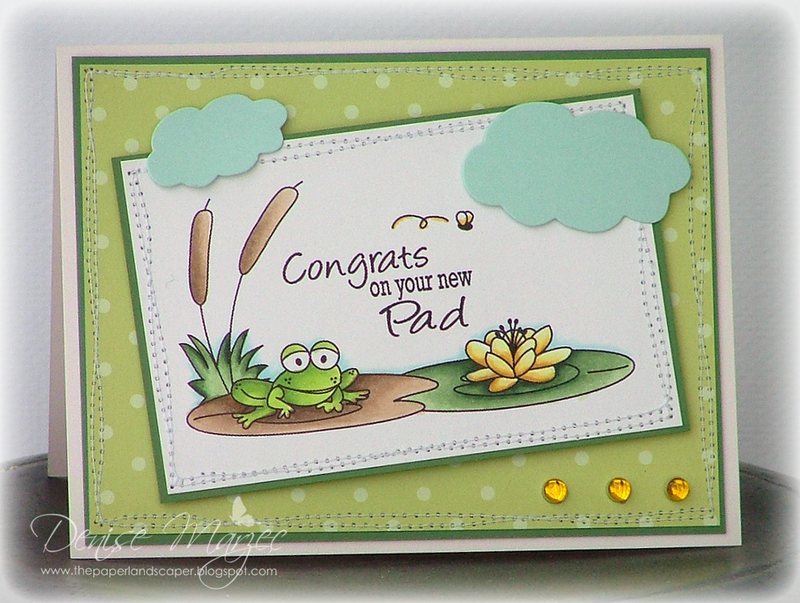 I'm back to show you another background project for this week's reader challenge on the PB Blog. 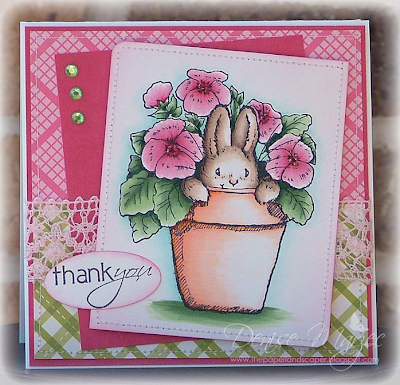 I just found out that my fellow Penny Black teammate Kathy Racoosin is giving away FIVE stamps to FIVE random winners! All you have to do is leave a comment this week on the Penny Black Blog during our "background stamping reader challenge." She'll announce the winners on her blog next week. How cool is that?! Thanks, Kathy! 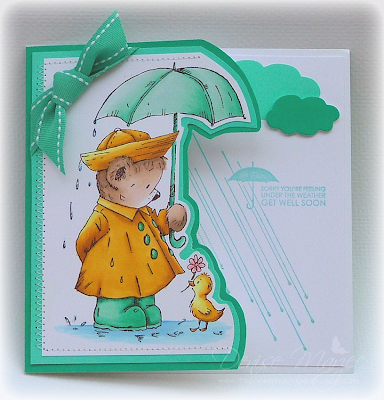 For my card today, I paired up Sunshine in the Rain with Get Well Soon. I put the rainy background and sentiment on the inside of the card and did some fussy cutting to the front of the card so that everything would show together when the card is closed. The small darker colored cloud is up on foam tape. Stickles were added to the water and raindrops. The bright teal CS colors are from my Sea Breeze Tritone pack. 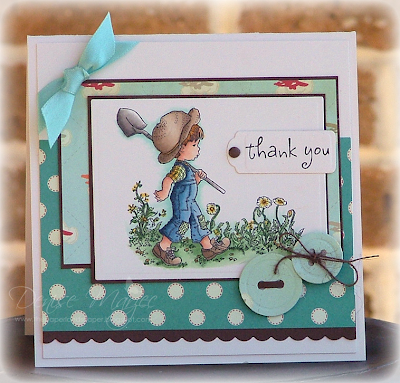 Thanks so much for stopping by today and I'll be back tomorrow with another card with background stamping. Hi everyone! 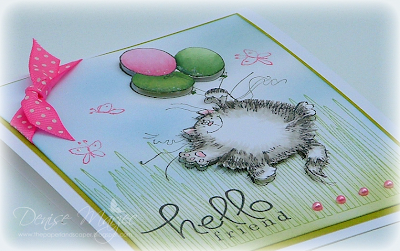 I'm hosting this week's reader challenge on the Penny Black blog, which is to add background stamping to your project. 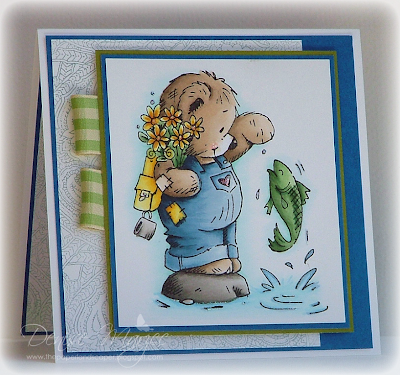 For my card, I used Fishing Friends and paired it up with this pretty paisly outline background. The main matted image is up on foam tape, and it's matted with Penny Black Clear Skies and Fern Green Tritone CS. I put my sentiment on the inside, which I pulled from my Hello Friend clear set, and used some more of that paisly outline background. I'll have background projects today through Thursday here on my blog as well as the Penny Black blog. Don't forget, if you participate in the reader challenge and upload your project(s) to the Penny Black Flicker Gallery, you'll have a chance to win some brand new Penny Black stamps of your choice! 100th Sketch on the Sweet Stop! Hey all! 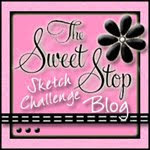 This week is a very special week over on the Sweet Stop Blog. It's not only our "Sketch with a Spin Week" but it's also the 100th sketch!! Korin is offering up a chance for you to win a $25 gift certificate to the store AND a tutorial CD from Technique Junkies. 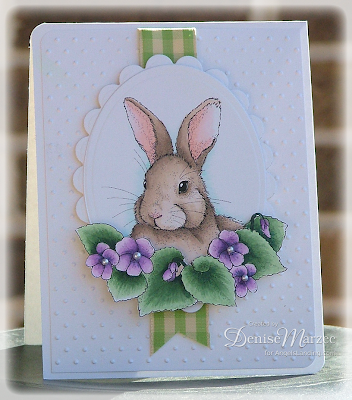 Hop on over to the Sweet Stop Blog to find out more details. For my card today, I used this cute elephant from OCL's new Circus Circus set. 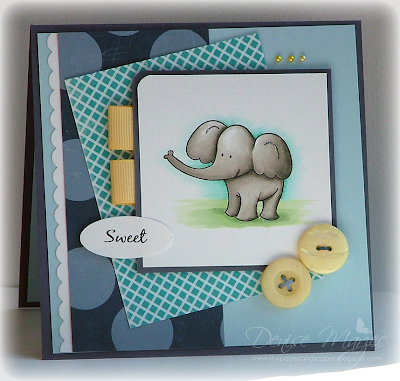 I used the "sweet" sentiment to go with this week's sketch with a spin theme. The main matted image is up on foam tape, I added a little bit of stardust Stickles to the elephant's ears and on the grass around his feet, and the card measures 5" square. 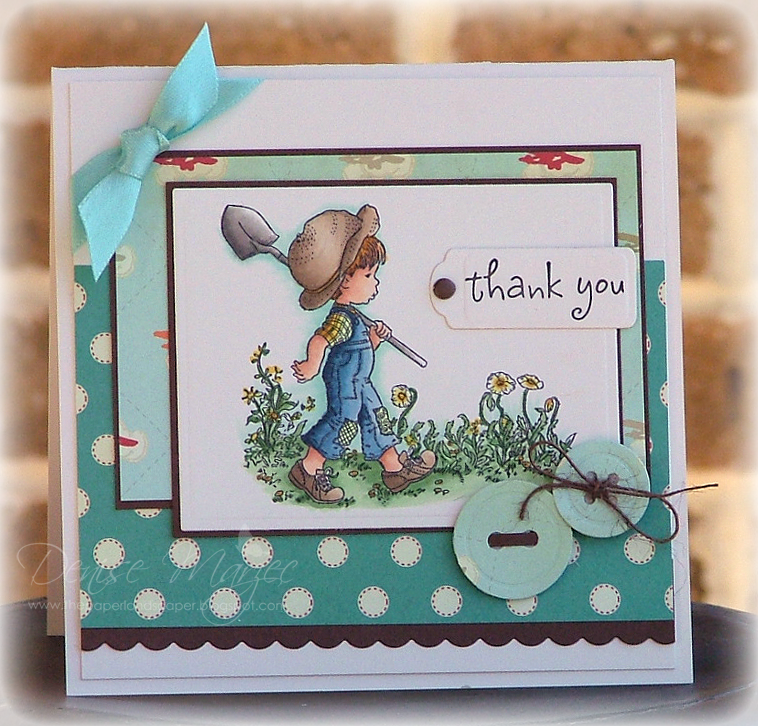 All the DP is Little Boy by Echo Park, which you can get over at Sweet 'n Sassy Stamps. Hi everyone! 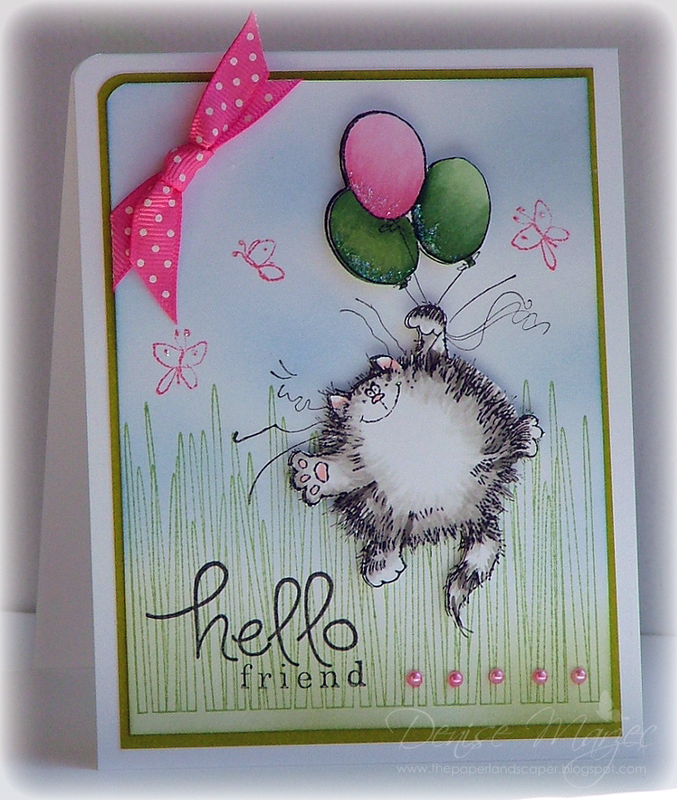 Have you been to the Penny Black Blog lately? This week, we're featuring glittery Easter cards and this is the card I made for today's post. 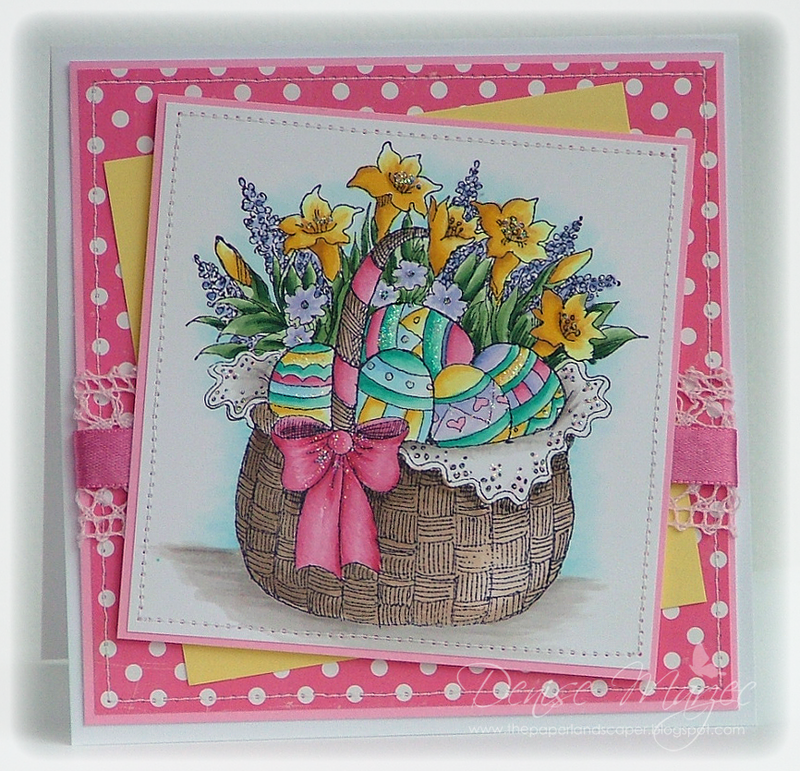 It's a 5.25" square card and I used my brand new Easter Basket cling stamp that was just released at winter CHA. The DP is "Little Girl" by Echo Park. 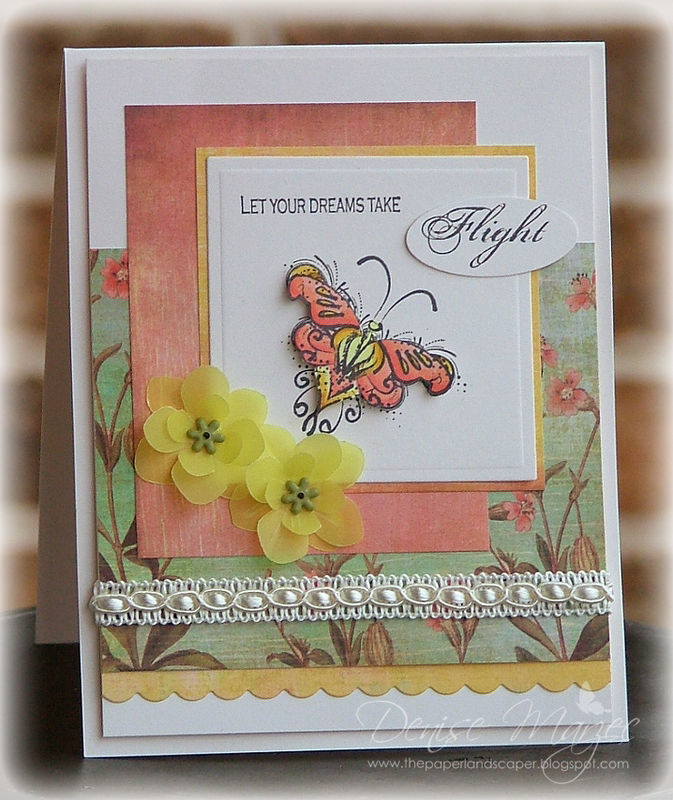 The yellow and pink CS are the new "mix and match papers" by Penny Black...I used the lightest shades from my Rose Garden and Summer Sun tritone packs. The main matted image is up on foam tape, and I used stardust Stickles glitter glue on various parts of the image. It's time for this week's Sweet Stop Sketch! Whoo-hooo! 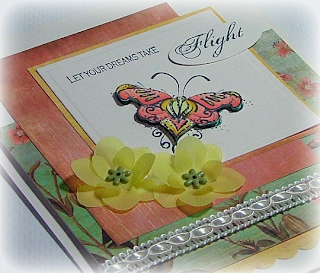 For my card, I used OCL's In Flight. 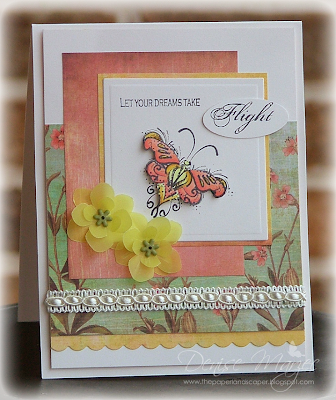 I stamped the butterfly twice and popped the second one up on foam tape. Here's a close-up so you can see the dimension. 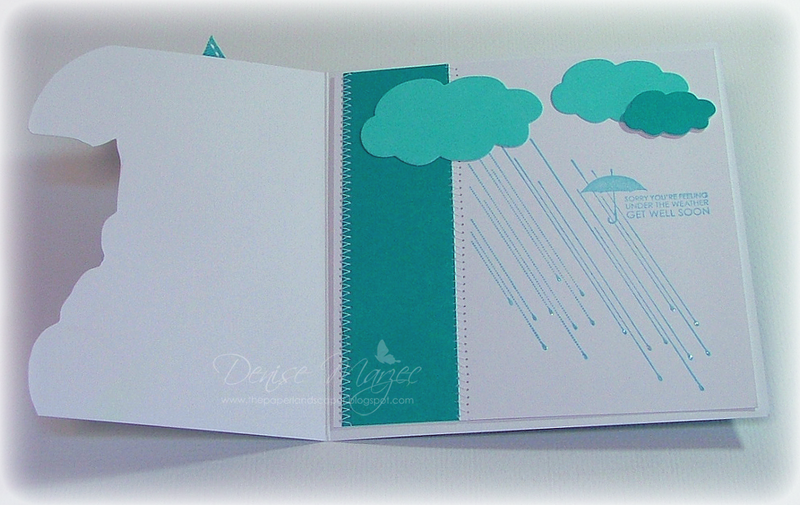 Here's another sample card I made for the OCL booth at CHA. The images and sentiment are on Cryogen irridescent white shimmer CS, and the matted main panel is up on foam tape. Hey all! On Saturday, I was at a really fun stamping get-together with friends and colored up this absolutely gorgeous digi image from Angels Landing. 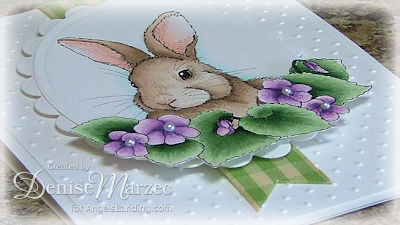 The scalloped oval is also up on foam tape. All of the white CS is shimmery Sparkle Blanc from Paper Temptress. You can't see it in my photo, but the shimmer in the CS shows through the Copic coloring....nice! Thanks for stopping by and I hope you have a really great day! Hi all, it's time for another Sweet Stop Sketch! For my card this week, I wanted to ink up this SWEET Stampavie stamp that Michelle sent me from Stamper's Dream. 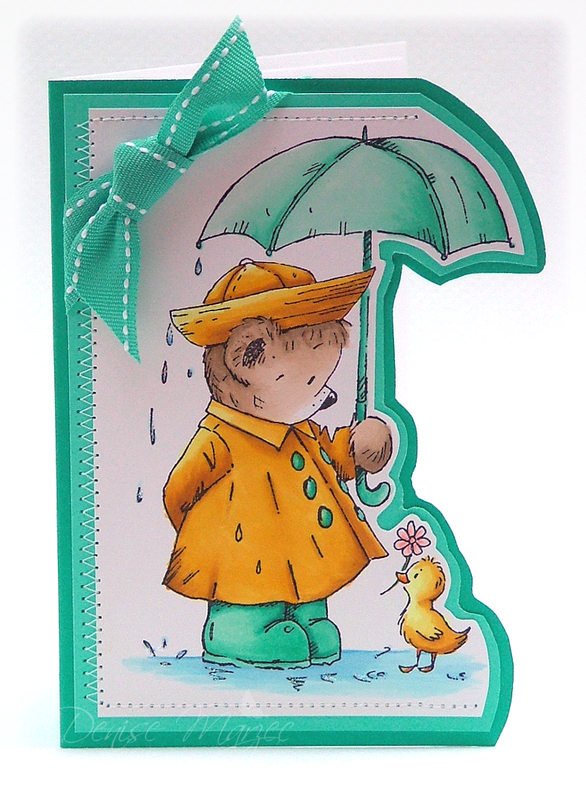 She's such a sweetheart...she knows how much I love Sarah Kay stamps. Thanks, Michelle!!! This card is for you, lady. Hope you like it! 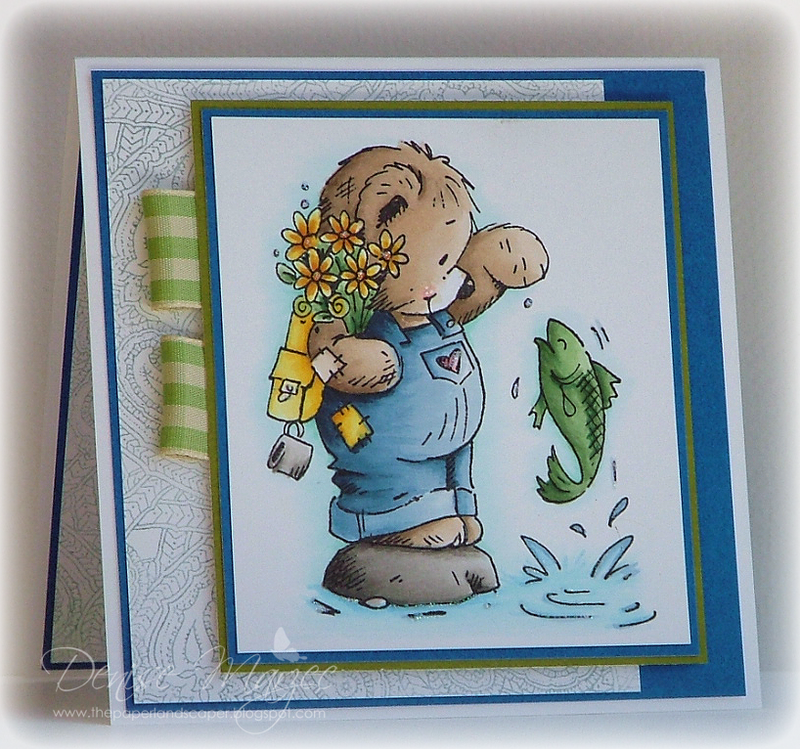 Here's another card I made with The Pond, a brand-spankin' new set from OCL that was just released at CHA. I love this sweet duck and that quote from Dr. Seuss! The kraft scalloped rectangle is up on foam tape and the main images/sentiment are on Cryogen irridescent shimmer CS.